L'endroit idéal pour appeler à la maison pour toutes vos aventures de pêche! Bien que cette région est connue pour la pêche de classe mondiale, il n'y a pas de limite à vos options pour les activités. Il y a plusieurs sentiers pour la randonnée, flottant de la rivière Kenai, kayak sur le lac Kenai ou de prendre une balade à cheval. Opportunity abonde pour la faune de l'orignal, ours, aigle, hibou, le castor et le lynx. Le Cubhouse est parfait pour votre plaisir de la pêche à Cooper Landing. Seuls quelques miles au ferry de Russian River, à un prix raisonnable et spacieux pour deux à partager confortablement. 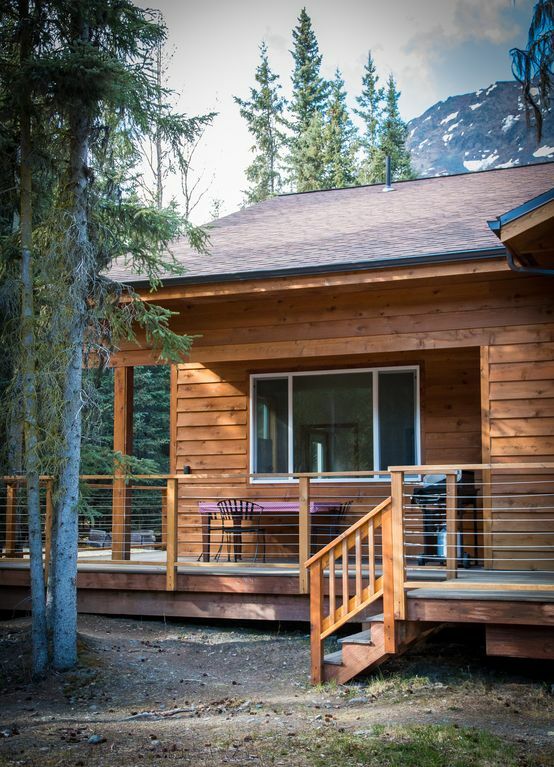 Great attached cabin, in a great location! Stayed here for two nights with my 12 year old daughter in late August for two nights on way to Homer. Property is off the main road and wonderfully secluded. Cabin is roomy and comfortable, functional décor. Robb and the dogs were the main attraction. Great visiting with the dogs and watching them interact with one another. Learned a bunch from Robb about mushing; checked out his sleds, gear, etc. Great stay and will stay here again no doubt. My thanks Robb! Beautiful cabin nestled in the mountains and lake. Comfortable with all amenities. We extended our stay for another day just because it was so peaceful and comfortable (like home) place. The hosts Evie and Robb especially are warm great. Would definitely come back here again! Great Place to stay. Super nice people. Another vacation in beautiful Alaska! We stayed in Cooper Landing at the Bear Den, where the accomodations are stylish, bright and very comfortable. The spacious bedroom sleeps four, so it is the perfect get-away for a couple or small family. Our busy days began with a leisurely breakfast in the sunny well-appointed kitchen. It’s large windows greet you with a view of the mountains. This is the perfect place to relax after a full day’s activities. You can cook in or outside on a lovely gas grill. Hosts, Robb and Evelyn Bear of “Just Bears,” are happy to share inside knowledge of the area. This is also a rare chance to see a real dog-sled team and learn about the sport that Robb so loves. We highly recommend this location and are sure to return. Situé près de la rivière Kenai avec arc en ciel de classe mondiale truite et la pêche au saumon.